John Deere dealership with locations in Norman, Kingfisher, Purcell, and Enid. Provides banking services for both personal and commercial customers. Manufactures pre-portioned, ready-to-cook, and fully cooked beef, pork, veal, chicken and turkey products. Enid, Oklahoma. In-home studio specializing in weddings, events, sports, and family photography. Enid. Locations in Enid, Oklahoma, Dodge City, Kansas, and LaJunta, Colorado. Also offer online and video auctions. Amulet jewellery, shaman talking sticks and large figurative sculptures. Dedicated to the sale of secondhand books, annuals, comics and magazines. Find Enid Blyton, bestsellers, Commando comics, The Muppets, and Dr Who. Order by email. Provides general unit information, photos, calendar and resource links. Pro shop, membership details, fees, and hole descriptions. Enid. Located in Enid, OK and specializing in bi-color and solid Persians and Exotics. CFA, ACFA, TICA registered. Enid. Virtual tour, staff profiles, FAQ, newsletter, and forum. Information on the inpatient, outpatient, emergency, and community health services provided by this Enid facility. Show horse ranch in Enid, Oklahoma with information of each animal available including pedigrees and all available services. IMCA modified and street stock drivers Caren and Dale Winchell, a married couple, whose home track is Enid Speedway in Oklahoma. A family oriented Club providing opportunities for fun and learning with horses. Includes schedule of events and membership information. Promoting youth recreational and competitive soccer including small-sided or micro games on 27 acres of fields. Affiliated with USYSA and the Oklahoma Soccer Association, located in Red Carpet Country. Meets on the 1st and 3rd Thursdays, 7:30 PM. Location, officers and links. Ministry, worship, Sunday School, sermons, current newsletter, monthly calendar of events, staff listing, driving directions, and links to Enid attractions. Information on activities, programs and services. Enid,Oklahoma paranormal team with full length videos. Wish list, explanation of adoption fees, and photographs of animals in need of homes. Displays Sunday and Wednesday worship and activity schedules, map/directions, a staff directory, church history and program info. general practice firm, located in enid, offering services for matters including insurance defense, criminal defense, professional malpractice, and family law. 39 Chisholm Trail Cowboy Church Enid, Oklahoma. Enid, Oklahoma. Browse a calendar, view photos, or read news. Learn about the singers, prior guests, and trail rides. Enid. Operates St. Joseph Catholic School. Religious education programs, sacraments, and saint and feast days described, schedules, obituaries, prayer requests, photographs, and Catholic links also provided. Guided by Bob Adamson and John Wheeler, he is the author of Oneness and Living in Silence. There are a number of essays, extracts from the new book and endorsements, an audio file of talks and (pending) details of forthcoming talks (he is based in Enid, Oklahoma). family owned and operated since 1915, serving northwest oklahoma. includes detailed consumer information with links to local florist, online planner, casket gallery, faqs and contact details. focus page offers regional and community topics of interest. an article by terri kovacs about enid blytons work, and her use of golliwogs. features parodies of enid blytons works, including the famous five, the faraway tree and brer rabbit. an unofficial enid blyton home page. her life, her books, and a catalogue of a personal collection. Includes pictures, biography, and resume for the actress who played Firell. Biography, discography and news from the Enid, Oklahoma-based rock musician. Sells Amar Chitra Katha, Asterix, Tintin, and Enid Blyton comics. a listing of many enid blyton titles, along with reviews and information for collectors. Available for murder mysteries, roasts, and corporate events in the Mid Michigan region. Contact and booking information included. book summaries, cover art from newer editions and screen shots from tv series. dedicated to the childrens writer enid blyton and her book 'the magic faraway tree', which includes quiz, pictures, snowglobes, and biography. includes band history, news, information on joining the stand (enids fan club), a discography, sound samples, and cd information for the classical prog band. 56 Gaslight Theatre Enid, OK.
Enid, OK. Northwest Oklahomas oldest and most active community theatre. Gaslight produces 8 shows annually including Oklahomas only free Shakespeare in the Park. a comprehensive listing of enid blyton titles along with publishers, publishing dates, illustrators and other information for collectors. the information is clearly set out in categories and there is an a-z title listing included. contains a translation from german of a malory towers book (more to follow) written later by a german author that was until now unavailable in english. also has some other information about enid blytons malory towers series. SiteBook Enid City Portrait of Enid in Missisippi. 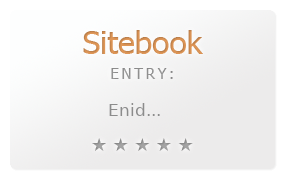 This Topic site Enid got a rating of 4 SiteBook.org Points according to the views of this profile site.